Should you make space in your luggage for the Sony SRS-BTX500 wireless speaker? The SRS-BTX500 is a premium priced wireless Bluetooth speaker, but has Sony left it too late to compete with the Philips P9 and Bose SoundLink II? In times gone by, travel speakers were as throw-away as flip-flops but these days having hi-fi quality on the go is a must - and with prices hovering around £250 we're not afraid to invest in the best. 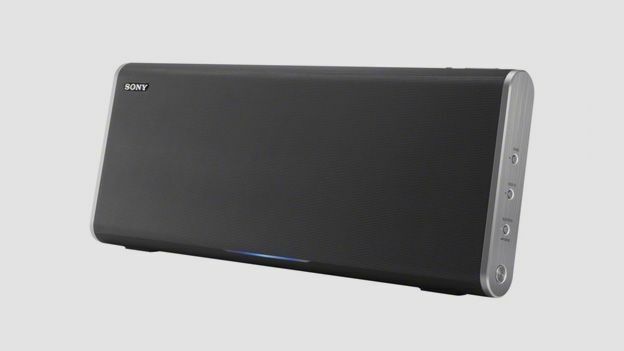 With the Sony SRS-BTX500, the brand has created a high-end Bluetooth speaker with NFC technology that looks the part, but can the sound quality complete with the Bose SoundLink II, Big Jambox and Philips P9? The SRS-BTX500 is portable, but at 38.5cm long and weighing a hefty 2kg it can hardly be described as a 'travel' speaker. You'll not want to lug it around for long, but for weekend breaks in the car and posh picnics it works wonders. You're better off thinking of it as a replacement radio, and a mighty handsome one at that. The combination of metal grille, brushed metal side panels and smooth matt black plastic looks are on a par with the gorgeous Philips P9. Build is reassuringly solid and while the 2.1 speaker configuration makes the unit quite chunky, the tapered back gives the illusion the SRS-BTX500 is supermodel thin. If you have a compatible smartphone (including iPhone 5, Samsung Galaxy S3, Samsung Galaxy S4 and Sony Xperia Z), connecting to the SRS-BTX500 couldn't be simpler using NFC, just tap (once you've downloaded the right control app) and away you go. But connecting using Bluetooth can hardly be described as troublesome either. It's a simple one button press. In our test we managed a range of 8m through walls and 10-12m outside. Other connections are limited, but useful. There's 3.5mm audio-in and a USB port for charging your phone away from the mains, but be warned it will dent the speaker battery life. There's also a hands-free option - it isn't automatic, you need to push the call button on the speaker when your phone rings - that works fine if you want to hear booming voices. Sorry Sony, but six hours isn't enough these days, especially as there's no room in the neoprene travel case for the mains adapter. Bose and Philips both quote 8hrs while the Big Jambox manages up to 15hrs. Give the SRS-BTX500 a listen and you'll soon forgive the meagre battery life. With 40W total speaker power across two 70mm drivers it manages room-filling hi-fi quality sound with ease. There are three EQ options also available, which make a real difference to performance. 'Standard' sounds surprisingly distant and a little weedy while 'Megabass + Surround' overcooks the bass. But fear not Goldilocks, 'Megabass' is just right offering an enjoyable combination of punchy bass and balanced mid-ranges. The SRS-BTX500 is also loud enough to annoy several sets of neighbours, but push it past about 70% and sound quality suffers. It may have arrived fashionably late to the Bluetooth speaker party, but with the SRS-BTX500 Sony has produced a top-notch wireless design that looks and sounds every bit as good as the competition. It's no travel speaker and the battery life is more tea than house party but it makes an excellent go-anywhere hi-fi for the garden and a more than capable stereo replacement. At £279 we can't call it a bargain, but you won't feel short changed with its performance.